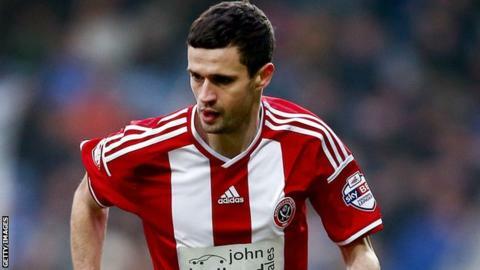 Substitute Jamie Murphy's second-half double moved Sheffield United into the play-off places and toppled Swindon from top spot in League One. Kick-off was delayed by 15 minutes because of congestion outside at Bramall Lane and the game proved to be a fierce affair with nine yellow cards. Murphy, who signed a contract extension with the Blades before the match, swept home the opener from inside the area. And he made it 2-0 when he chipped over goalkeeper Wes Foderingham. Murphy broke down field and netted his second after Swindon had a penalty shout waved away following a trip on defender Jordan Turnbull. Mark Cooper's side, playing for the first time in two weeks, were replaced at the top of the standings by MK Dons, while Sheffield United moved up to sixth. Swindon had their chances to get on the score sheet, but Jon Obika saw his shot palmed away by keeper Iain Turner and John Swift then fired over the bar, while Louis Thompson blazed over from 30 yards. "They were a little bit rusty at times, one or two of them haven't played an awful lot. "But they got through the game and we just about deserved it. "Both different goals, but the desire of Jamie to run ,and really sprint, to get in the box on both of them." "You can't have that many chances and create that much opportunities and not score, and then expect to win the game. "We just need to be calm and roll the ball into the goal. "Frustrating I think is the word. On another day we could be three or four up at half-time. "Full credit to Sheffield United, they've done a job on us." Match ends, Sheffield United 2, Swindon Town 0. Second Half ends, Sheffield United 2, Swindon Town 0. Goal! Sheffield United 2, Swindon Town 0. Jamie Murphy (Sheffield United) right footed shot from the centre of the box to the centre of the goal. Assisted by Terry Kennedy. Corner, Swindon Town. Conceded by Kieron Freeman. Attempt missed. Louis Thompson (Swindon Town) right footed shot from outside the box is close, but misses to the right. Substitution, Swindon Town. Jermaine Hylton replaces Andy Williams. Substitution, Sheffield United. Jose Baxter replaces Paul Coutts. Goal! Sheffield United 1, Swindon Town 0. Jamie Murphy (Sheffield United) right footed shot from the centre of the box to the high centre of the goal. Assisted by Louis Reed with a cross. Attempt missed. Terry Kennedy (Sheffield United) right footed shot from the centre of the box is close, but misses to the left. Terry Kennedy (Sheffield United) wins a free kick in the attacking half. Attempt blocked. John Brayford (Sheffield United) left footed shot from the centre of the box is blocked. Nathan Thompson (Swindon Town) is shown the yellow card. Attempt saved. Jamie Murphy (Sheffield United) left footed shot from the left side of the box is saved in the top left corner. Harry Toffolo (Swindon Town) is shown the yellow card. Louis Reed (Sheffield United) wins a free kick in the attacking half. Attempt saved. Terry Kennedy (Sheffield United) header from the right side of the six yard box is saved in the top centre of the goal. Ben Davies (Sheffield United) wins a free kick on the right wing. Substitution, Sheffield United. Stefan Scougall replaces Kieran Wallace. Ben Davies (Sheffield United) wins a free kick in the attacking half.